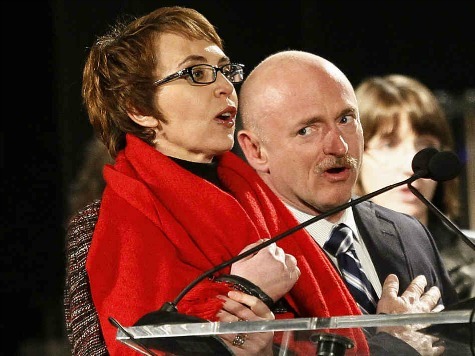 Gabrielle Giffords and her husband Mark Kelly want to challenge the NRA in Congressional races in 2014. Ten months after the heinous crime at Sandy Hook Elementary and six and a half months since a Tucson gun store owner refused to sell Kelly an assault weapon–believing he could not pass question 11a of the NICS background check–Giffords and Kelly are readying themselves to go after the NRA for opposing expanded background checks. To do this, they are raising funds via their gun control group, Americans for Responsible Solutions (ARS). Kelly admits the NRA does a great job getting its message out; between its successes in 2012, its victory against expanded background checks in the Senate in April 2013, and the ouster of two pro-gun control senators in the Colorado Recalls, the NRA is not only winning but is fast setting the terms of the debate as well. Yet Giffords and her husband say background checks must be expanded, and that is where they plan to lock horns with the NRA. It is worth noting that besides being denied an assault rifle in March of this year, the requirements of our current background check system also halted a handgun purchase Kelly tried to make in February. Thirteen days before successfully passing a background check for a 1911-style semi-automatic handgun, Kelly walked into Diamondback Police Supply in Tuscon, AZ, and was not allowed to buy a handgun because he showed an ID from Texas instead of Arizona.